The more users advance down this funnel, the better are the results of the mobile marketer. Knowing the conversion rates between all these steps helps us understand the weak and strong parts in the marketing funnel. Improving the weak parts according to the conversion rates may greatly affect advancing more users down the funnel. 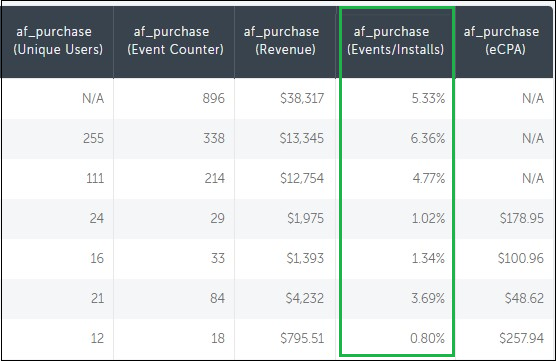 So, what are the different counters and conversion rates available from AppsFlyer? The funnel starts with the creative ads displayed to potential users (impressions) and subsequent clicks. AppsFlyer displays both figures (from supporting networks), which enables calculating the overall or networks specific Impressions to Clicks conversion rate. When a user clicks on an ad, they are redirected to the app store. How many users leave this process before the app's page is fully loaded? That’s impossible to tell, as this information is reserved for the app stores only. However, this information is meaningless. The app page load is an essential step in the funnel and is controlled entirely by iTunes or Google Play, so it cannot be omitted or optimized by app owners. The next stage of the funnel is the number of visitors who download and install the app before the first launch. This number is supplied by the relevant app stores, but of course this does not include AppsFlyer’s breakdown of the install sources. Again, as in step 2, AppsFlyer cannot access this data, as the SDK is still inactive at this stage. However the next step in the funnel hints at this step. First app launches are finally countable by AppsFlyer since the SDK is now activated and able to send data. This number is roughly 10% lower than the total number of installing users (step 3), meaning that about 10% of the users that install an app never launch it for the first time. On the other hand, can you really call them users if they don’t launch the app even once?! For example, if AppsFlyer shows 200 installs on a specific campaign, roughly 220 users have downloaded the app, and 20 of them have not become users. 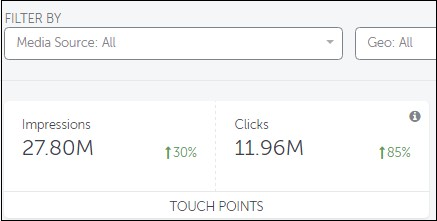 This first launch figure also allows for the Clicks to Users conversion rate presented on the Aggregated Performance Report. The last stage of the funnel incorporates multiple possible steps, where users who launched an app at least once and then perform an action such as registering, purchasing or completing levels etc. AppsFlyer enables app owners to report on these events and automatically calculates the ratio of actions from first launches, which enables Cost per Action (CPA) considerations. There are five major touch points where users may drop off the mobile marketing funnel and AppsFlyer provides the numbers for four of them. The most important conversion rates, which are the top notch indicators of media source quality, are the Clicks to Users and Users to Actions conversion rates. Both of which are supplied per media source, campaign, ad group, ad set and single ad levels on the AppsFlyer's dashboard.